Due to a lack of general photos of the event, I’ve lifted some from the official Facebook page. If you have any decent ones you could contribute, drop me a mail. 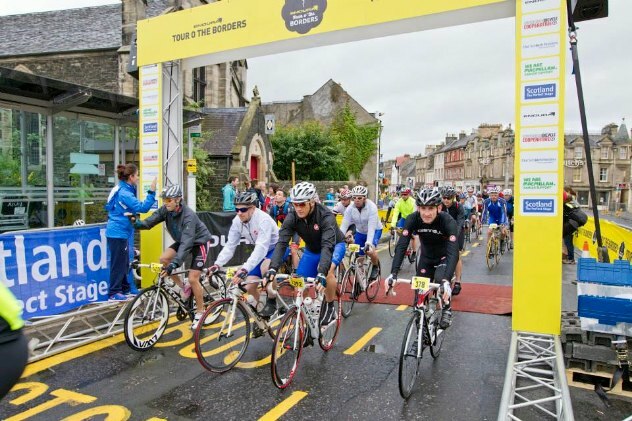 The 2014 edition of the Tour o’ the Borders was a giant leap forwards, with a 75 mile fully closed course that winds for 75 miles over the hills of Selkirkshire*. * OK, and a little stretch of Peebleshire at either end! 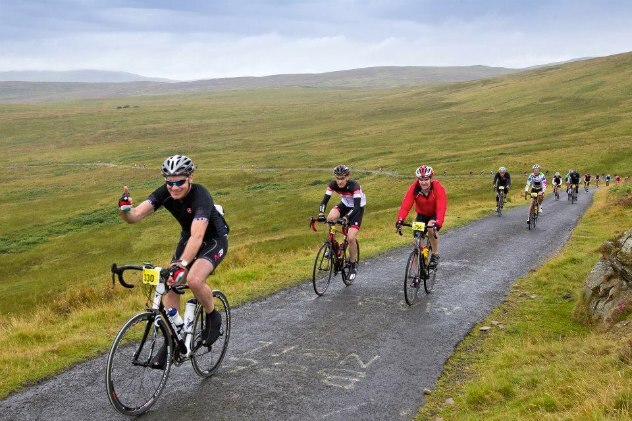 The course takes in four climbs – Paddy Slacks, the Woll at Ashkirk and both swires between the Ettrick and Yarrow valleys (sometimes called Berry Bush and Witchy Knowe). The last third of the course is a long flat finish down the river Ettrick and back up the Tweed to Kailzie on the outskirts of Peebles. 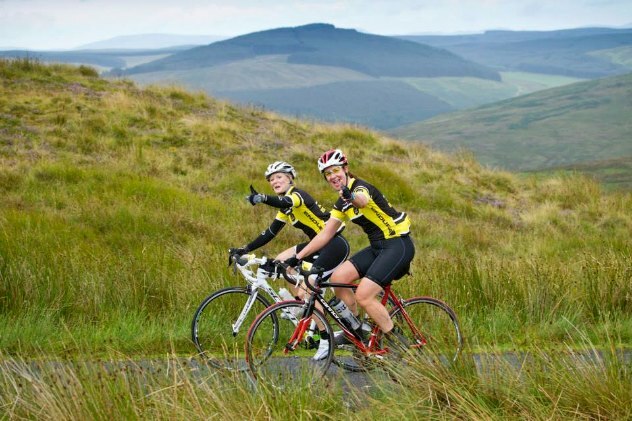 Between the climbs are mile upon mile of twisting, mainly singletrack road in stunning isolated landscape. The road from top of the Ettrick valley over to Ashkirk (the high table on the course profile, after the first two climbs and before the final two) more than makes up for the lack of gradient with stunning scenery and fantastic flat-out carving turns. On closed roads the descending is just sublime, especially dropping into Ashkirk and then off the Woll, leaving the spectacular hurtle down the bottom swire to last. Mind the sheep! Even the 25 miles from the bottom swire to the finish (at best rolling, but if we’re honest, pretty flat) have the novelty of the closed road and a field of over a thousand riders to keep your blood up. Credit to the organisers for putting together a really well organised event. The previous year (when the roads weren’t closed) it was run out of the High School with riders slipping out onto the open road in small groups. This year it was a massed start in big waves from Peebles High Street, but everything still went off beautifully without a hitch. From the start line on Peebles High Street to the first climb is just under seven miles – out on the A72 then crossing to the south of the river (B7062) at Cardrona. Perfect to get warmed up before the climb up Paddy Slacks creates an opportunity for the keen. Paddy Slacks is a long drag, over four miles but under 3% average grade (although it steepens a little in the last mile to 5% or so), and I settled in for a spin at 250W, which was good for over 15mph and seemed to get me up faster than most. The descent is long and not too heroic, good to get the eye in – just a couple of corners really but the closed roads made it possible to carve through at 35mph+ and there was loads of room for overtaking – very cool. Hammering across the junction at the Gordon Arms at full speed was pretty special too… I’d never trust my ears enough to roll the give way on a normal ride! The climb up to Berry Bush (the top swire) starts immediately and is another long drag where the recumbent was no disadvantage – this time just under four miles at under 2.5% average. So far nobody had passed me and I was feeling pretty good, but there didn’t seem to be any organised groups and I had the feeling that energy would be better spent later on, so I stuck to 250W again – this time good for around 17mph. After dropping down to the Ettrick (another nice long descent with great carving turns and no crazy) and crossing the river towards Hawick the riding gets really wild – decent surface on a desolate single track road with no civilisation to be seen. I guess most of the first wave were still in front, but at this point there didn’t seem to be much on the road and with nobody visible to chase, my pace went off the boil. Like an express train a big group picked me off at the top of a short rise, and immediately things got interesting. I jumped on the back, and whoosh! We started reeling in another big group, passing them at a fair clip, and obviously *those* guys knew a good thing when they saw it too, so everything started to dissolve – four or more abreast on a narrow road with passing spaces… wish I’d taken the headcam! There’s a short rise after Alemoor reservoir then a good steady descent, which was ace because the treacherous corner which is always covered in pea gravel from the timber lorries had been swept (!!) – I came within a hair of stacking it on that corner just the week before and it would have been carnage otherwise. From here the road climbs in fits and starts, nothing noteworthy, before plunging into Ashkirk and the first real climb at the Woll, where the gradient hits about 1 in 6 on the steepest pitch. I knew I would need a bit of a head start on that climb if I wanted to top out with the group, so I decided to try and ride off the front before the descent off the moor. I gave it a good kick and out I popped – taking the sweeping corners on the moor with the hammer down and fifty riders streaming off behind me is probably the closest I’ll ever get to the feeling of a breakaway on le Tour… short but sweet! I’ve almost come a cropper on the descent into Ashkirk before and it was nice to be able to forget the possibility of oncoming traffic and use the full width of the road. Annoyingly, the road was coned off to maintain access for cars in Ashkirk, but as it’s only a singletrack road this meant trying to ride fast in about two feet of gravelly gutter (there were no cars in sight, of course). If I had to be picky, this was the most annoying bit of the day and I almost took a big spill trying to corner, but whatever.. it was only a few hundred yards. I was humbled a bit on the Woll but still put in a hard effort (just over 300W for ten minutes) and didn’t embarrass myself too much. Segment PR after forty miles at least… As promised, the High Baron dropped like a stone and I was off the front again by the time the road levelled for the run up to Ettrickbridge. Immediately after the village you’re climbing up towards the last (and biggest) hill of the day – the bottom swire (Witchy Knowe), which is couple of miles at a steady 7%, enough to make a bit of trouble. 285W was all I could manage now but everyone else was feeling the burn too and I passed a lot of folk in worse pain than I was in… the gel manufacturers were making a wad of cash at this point! 😉 . The descent of Witchy Knowe is a thing of beauty on a closed road, surreally fast with hard bends and bad surfacing. Averaging over 30mph on the tightest section, I think I was using a bit of luck here as well as the local knowledge – you could come a cropper pretty easily and I think there may have been some paramedic action a few waves behind. Just after Selkirk the road starts to climb again just a bit, to take you over the hill into the valley of the Tweed. I’d emptied my platypus of sports drink by this point and had my second wind, and thought it was now or never. I didn’t want to finish in a big group, so I kicked hard and jumped off the front. For whatever reason nobody tried to take my wheel and I was able to get to the top of the rise in the clear and use the shallow hill down to Yair Bridge to put some distance on. A couple of miles from Yair you pass the wee church at Caddonfoot and then turn at Peel for the back road to Traquair and on to the finish. 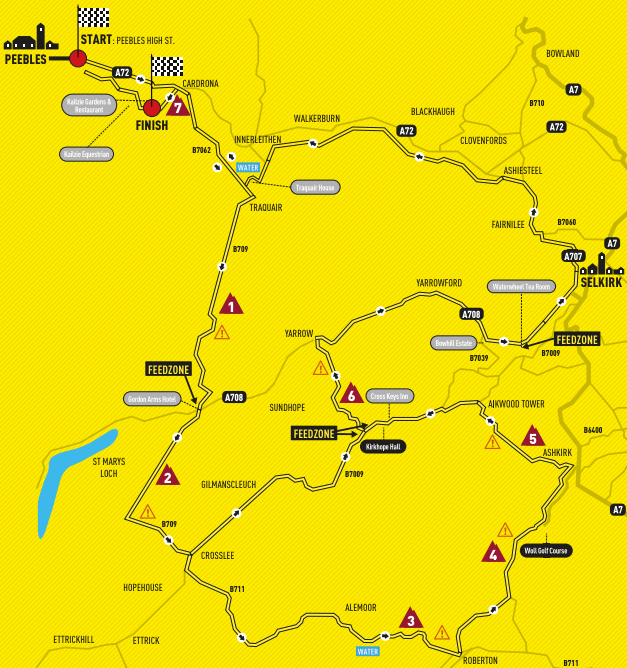 There were ‘ALLEZ!’ signs counting down the kilometres now which was a great touch – the road is rolling and bit more interesting with a few very sharp corners to catch out the unwary. Maybe I’ll take the hub dynamo and headlight off next year? Oops! A cracking route and a really well-organised, trouble-free day. Definitely not to be missed in 2015! I’m struck by the fact that they didn’t throw a wobbly at the thought of a recumbent participating. The local-to-me round Loch Ness etape made it very clear that nothing other than a standard DF would be tolerated, saying that recumbents would endanger other riders. 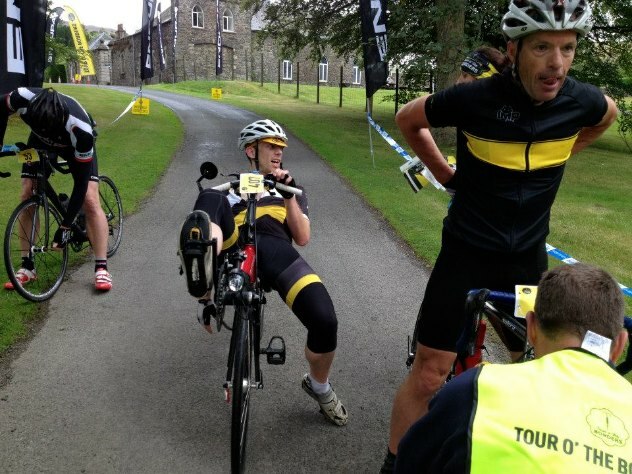 There have always been a few recumbents on the Tour o’ the Borders- two or three maybe each year. I really should have taken my headcam this year but the forecast was for hours of deluge so I didn’t bother. Pity as the footage of group riding would have been cracking and it didn’t rain in the end.